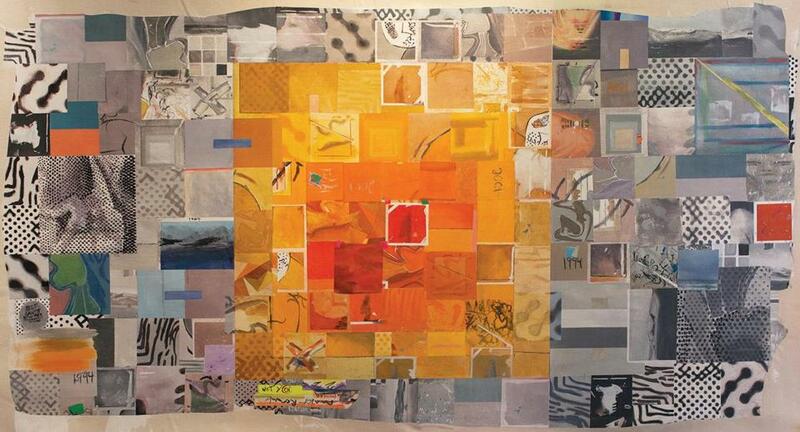 “Narrative/Non-Narrative: Two Artistic Approaches” at Fort Point Arts Community Gallery starts with the Modernist presumption that there’s a gulf between art that tells a story and abstract art, and concludes with the contemporary idea that they have more in common than we thought. Mario Kon carves into and paints on wood. His lean and compelling abstract designs play with space and perspective. In “After Shock,” he paints precise lines over a black ground — a white grid, red diagonals, a sense of infinite space and also of finite architecture — to which he adds frothy, organic curving threads of red and white. Sky and Kon — and maybe all artists — seek to convey that pattern in their work. In the end, Sky’s work is ornate and dreamy, and Kon’s more mathematical. Use pattern, rhythm, and layering, both leave us with a sense of mystery. On paper, the pairing of painter Claudine Bing and photographer Justin Freed seems as unlikely as that of Sky and Kon. 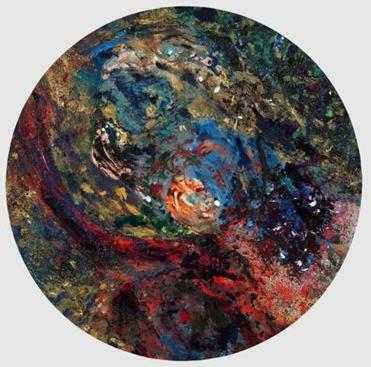 Bing paints cosmic abstractions, whirling with glinting disks in the dark, with liberal use of impasto. Freed is a landscape photographer. Yet these two fit as well, partly because Freed often uses a lens that arcs the horizon line, leading us swiftly from the curvature of our planet to that of Bing’s. Their show at Galatea Fine Art benefits, too, from each artist’s narrow aesthetic focus within multiple mediums. Freed’s images — in photos, video, and a photographic installation — meditate on the jagged forms of trees, and often the soft caress of water on the shore. His lovely video “Water From Rock” lingers on a dead tree overturned on a beach, as waves rush over the dark tangle of roots. Freed’s patient attention to form urges us to consider nature’s violence, and its gentleness. Bing’s paintings capture that balance, too, in her rough paint handling and the hint of light in the darkness, although they struck me as pat, their arms wrapping too easily around the universe. I preferred “Planet Fantasies,” metal disks infused with her imagery. Each appears to contain multitudes. 23 Essex St., Beverly, through Dec. 13. 300 Summer St., through Dec. 4. Cate McQuaid can be reached at catemcquaid@gmail.com. Follow heron Twitter @cmcq.